^^When you and your bro are making spring break plans. Holla!! We’re heading to the Florida Keys for spring break and can’t wait! 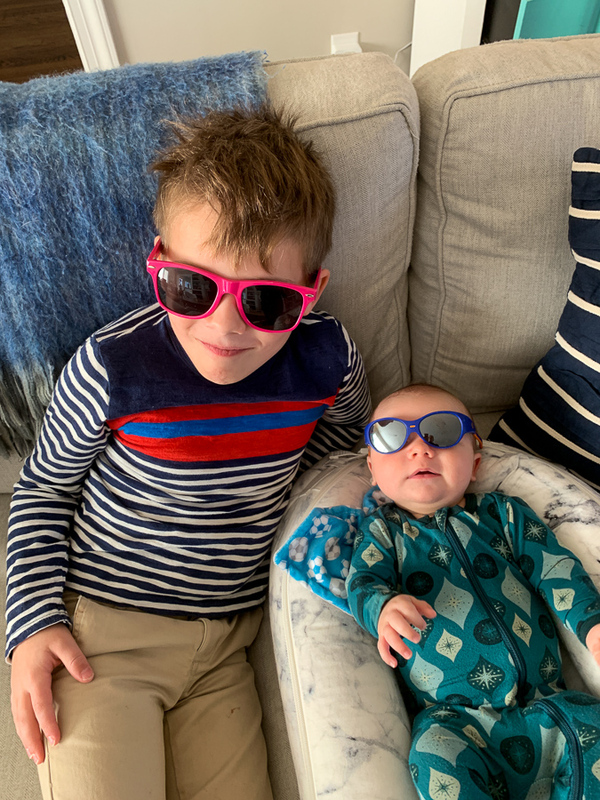 Normally I’d want to plan a warm weather trip for February – when the cold blues peak – but due to Mazen’s spring break we won’t be going until April. But at least Florida will be warmer then! 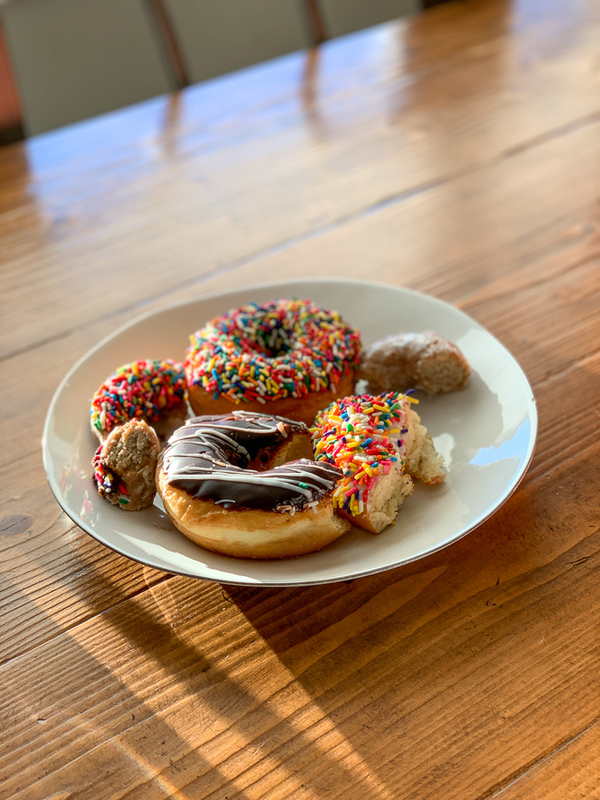 We had donuts for breakfast on Monday morning from Sugar Shack. The missing bites were because Mazen and I got into them on Sunday before I could take a photo! 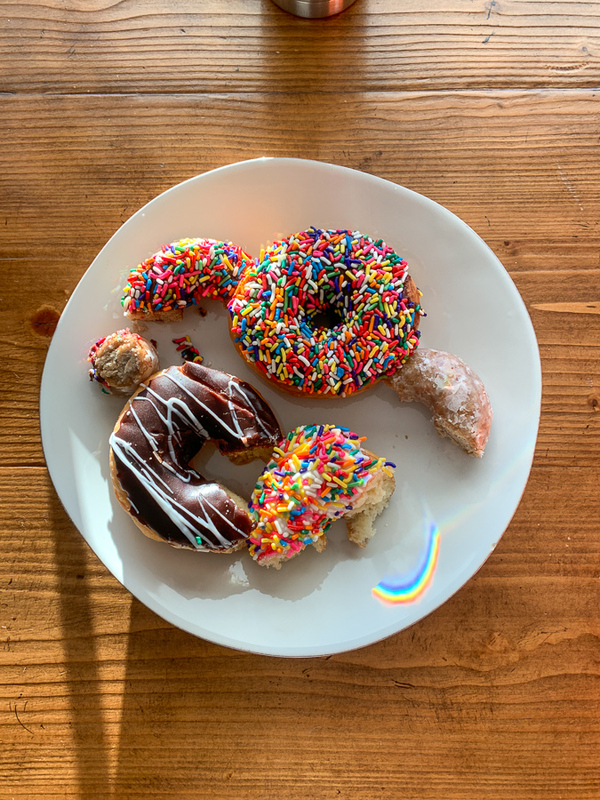 I love me some sprinkle donuts. Look at the perfect rainbow that Thomas’s coffee mug made on the below shot. Looks like magic! On the topic of the tropics, I have a delicious tropical breakfast bowl to share with you. 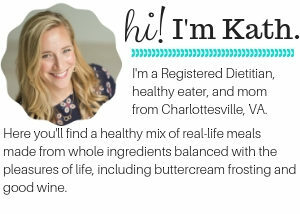 I have a dietetic intern – Emily – who is spending the semester with me. She’ll be fine tuning her “nutrition communication and food science skills” by helping me with some KERF projects, posts, and recipes. One of our goals is to share recipe formulas with you guys. 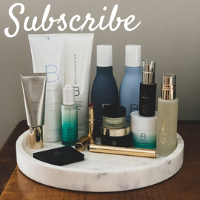 So rather than detailing out a tablespoon of this and 8 fl ounces of that, we’ll just bring together the ingredients for inspiration and you guys can tailor each bowl to your desires based on what you have on hand. 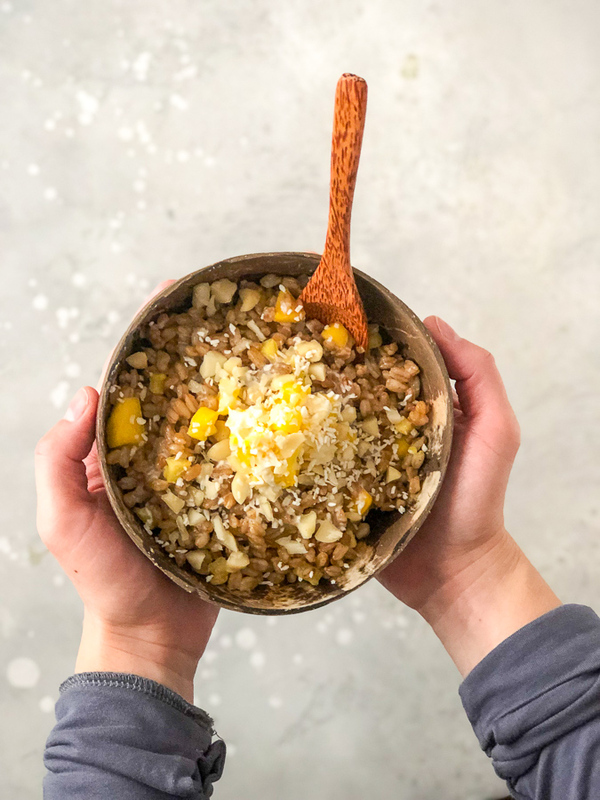 This Tropical Farro Bowl kicks off the series! I’ve been loving farro since the sweet potato + farro salad that Della offers via Plenty. I followed instructions on the package and toasted mine before cooking it in the rice cooker. 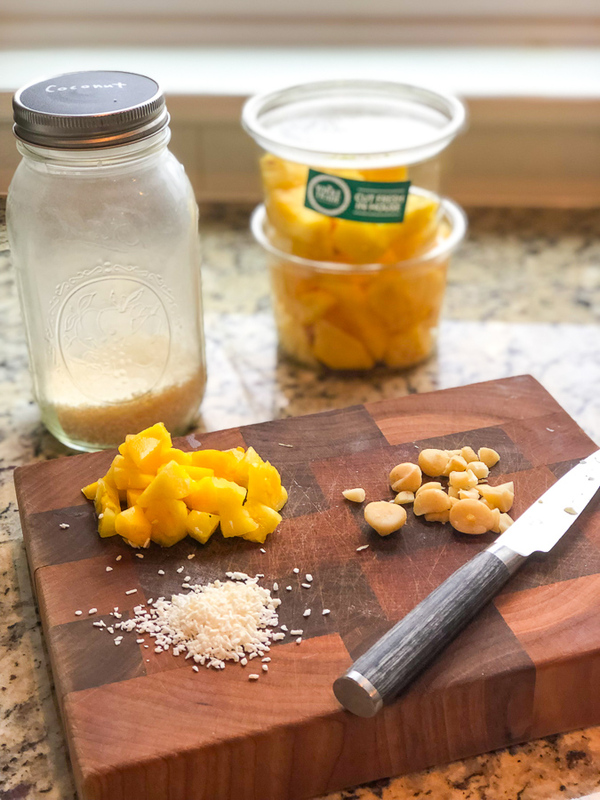 Once it was cooked, we added a little coconut milk, cinnamon, chopped pineapple and mango, chopped toasted macadamia, toasted coconut flakes, and a dollop of coconut cream (the thick stuff from the full fat can) to create this bowl. I had it twice for breakfast and enjoyed the rest of the cinnamony farro as a salad ingredient and oatmeal mixin! 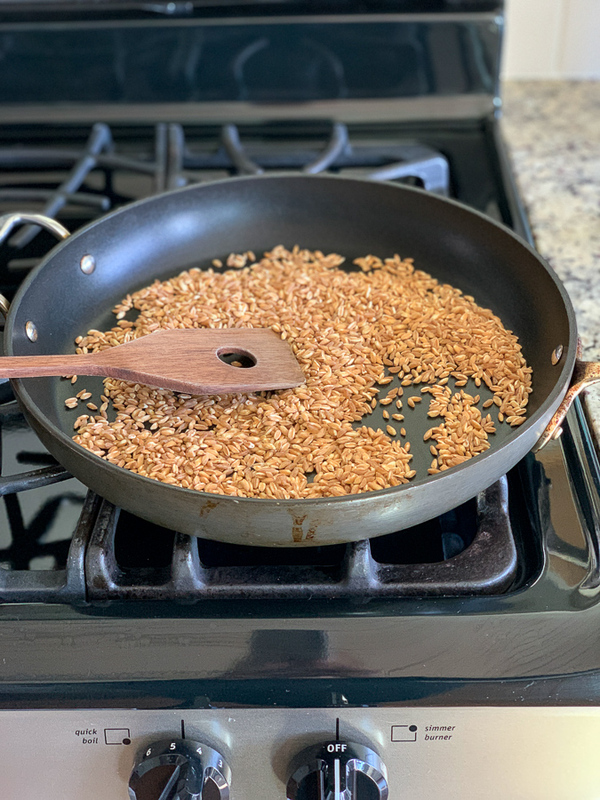 What’s your favorite way to enjoy farro? I make farro with sauteed bell peppers, tomatoes and Italian sausage (sometimes turkey sausage).I throw in sliced pepperoncinis at the end, sprinkle it with parm – so good! I am excited to try this breakfast recipe, though! I don’t think I’ve ever had farro. Though I’ve heard of it. It looks like a super hearty grain. Is this usually used for sweet dishes or savory? Usually for savory dishes – think rice, barley, etc. I don’t buy farro nearly as much as I should because it’s a chewy grain that i love! I usually pair it with savory foods (beans, eggs, veggies) but i love this tropical spin on it! 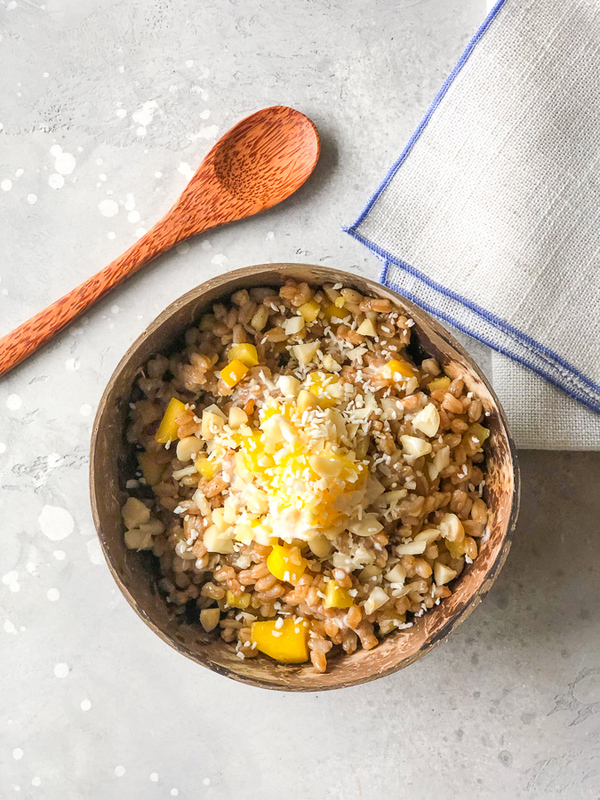 I don’t know why I never thought to use farro in a sweet dish before, but that looks heavenly! Is Birch wearing infant sunglasses?? So cute!